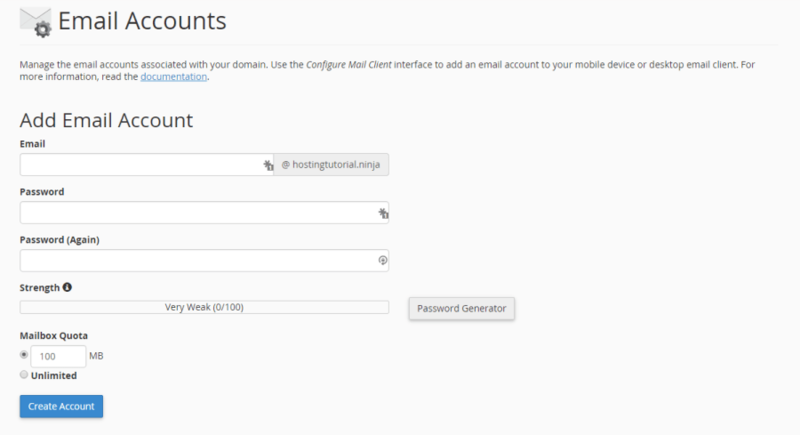 A detailed tutorial on how to create email Accounts in cPanel. Last updated: Jan 10, 2019. 11:47 UTC. When you first purchase web hosting from a provider no email account will be set up. You will need to log in to your cPanel account and create an email address. 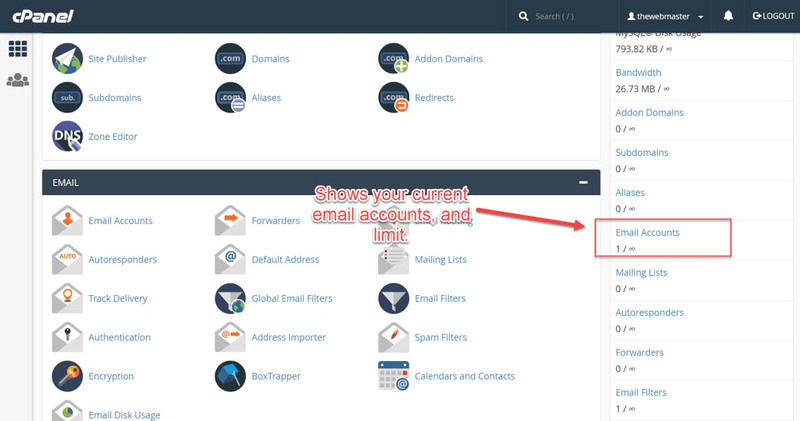 Adding an email address to your account in cPanel is very simple, and can be done in just a few minutes. Click on the Email Accounts icon on the cPanel dashboard. Click on the Email Accounts icon © The Webmaster. Password — Choose a strong password for your email. You will see the Strength Bar change, and this will indicate how good your password is. We recommend a strength of 70 or more for security purposes. You may wish to use the Password Generator to help you create a secure password. Some web hosts will set a minimum required password strength. A green password strength meter will indicate whether the password is equal to or greater to the required password strength. One of the most common ways of your account being compromised is due to poor quality passwords being chosen. You should take choosing a secure password seriously. Enter the Email Address you wish to create © The Webmaster. Some hosts will restrict the maximum mailbox size allowed in their terms and conditions. For most accounts, 500 MB should suffice. If you tend to email large files, you may want to increase this to either 1GB (or more) or if your hosting plan permits, “Unlimited.” You can allocate a quota of up to 4096 GB (4TB) (For a 64-bit system). For a quota above this level, you must select the “Unlimited” option. Choose your Mailbox Quota © The Webmaster. Once you have clicked “Create Account” you should see a message confirming that the account has been created. This message with a green background will show for 10 seconds, with a countdown timer in the bottom right-hand corner. Confirmation of Email Account Creation © The Webmaster. Once the email is created, you can change the password, quota, delete the email account, access webmail, or just configure your Email Client. You should be able to create your email account without any issues. An error is most likely caused by incorrect permissions on the mail folder. I recommend you open a support ticket with your hosting provider so they can take care of this for you. File open for /home/user/etc/domain.com/passwd failed with error No such file or directory. This error is caused by the wrong permissions or missing of the “etc.” directory in the user’s document root. If you are on shared hosting or managed hosting without root access, then your host will need to resolve this issue for you. Is there a limit to the number of email accounts I can create? Your web hosting provider will set a limit, whether that is 1 email address, or infinite. You will need to check your plan details or contact your host for further information. You can view the number of email accounts in the sidebar of the cPanel dashboard under the stats section. It will show the number of email accounts used, plus the limit (or show an infinity sign if unlimited). Email account limit. © The Webmaster.